So turns out, yes it was most likely heartburn. I still haven’t figured out when I experience it more, however laying down and drinking soda water do seem to bring it on. It’s not awful, but it’s quite uncomfortable. 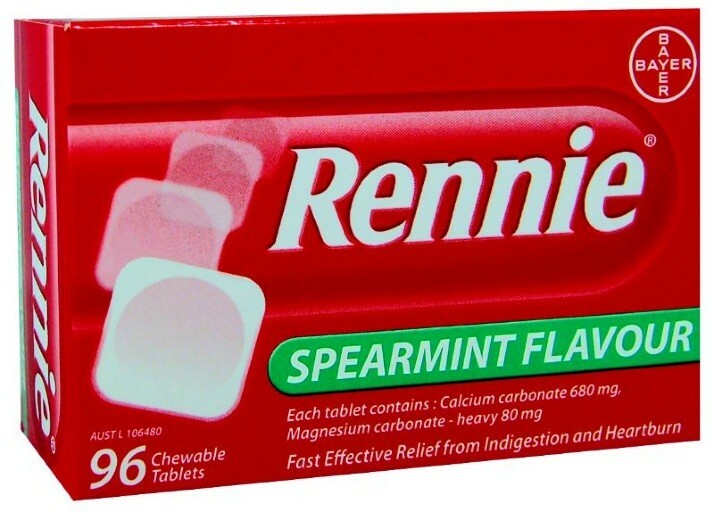 I had a look at some ways to get rid of it, and a simple Rennie helps keep it at bay for me. As long as the ingredients are calcium and magnesium based like these, they won’t enter the blood stream and harm the baby because they are naturally found in the body already. Avoid rich or spicy dishes as well as chocolate, citrus fruit or juices, coffee and alcohol. Avoid heavy meals by eating little and often and chew your food slowly and thoroughly. Give yourself two or three hours to digest any meals before going to bed. Sleep propped up in bed to give gravity a chance to keep the stomach acids down. You can use two or three extra pillows to prop yourself up, or raise one end of the bed, or you can also try sleeping upright in a comfortable chair. Wear loose and comfortable clothing, especially around your waist. Some women find that drinking a milky drink before bed helps their heartburn, although there is evidence that the fat content in milk can actually make heartburn worse. If none of the above help, talk to your doctor about an over-the-counter antacid that is safe to use during pregnancy. Take a dose at night-time if the heartburn is disturbing your sleep. Did you get heartburn while pregnant? What did you find was the best way to get some relief?